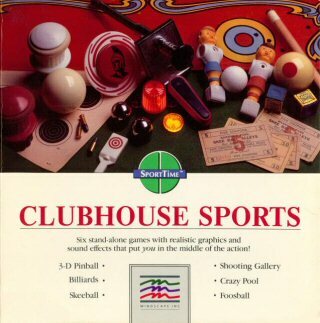 Released as American Club Sports in Europe. Graphics are of a high standard in all events and make good use of colour. Owing to the fact that there are six different games they're also quite varied. The sound isn't to the same standard, there is very little variation and what there is is nothing special. At the first the games are quite playable. well thought out control systems and the option of a human or computer opponent in most events all add to the initial enjoyment of trying to break the record scores. Unfortunately the games all become repetitious very quickly and monotony sets in. All the events feature loads of options but because of the simplasric nature of the games I don't think that Club House Sports will hold your interest for more than a couple of days.